A ferry (or ferryboat) is a boat or ship (a merchant vessel) used to carry (or ferry) primarily passengers, and sometimes vehicles and cargo as well, across a body of water. Most ferries operate on regular, frequent, return services. 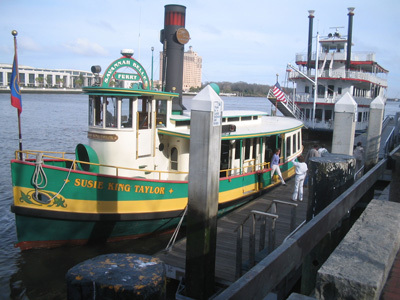 A passenger ferry with many stops is sometimes called a water bus or water taxi. The Thrustmaster Portable River Ferry is a simple, cost effective solution, that allows for rapid ferry deployment anywhere in the world.